In 2005, Miguel de Cervantes's superlative novel Don Quixote was 400 years old. As I described in a post at the time of the anniversary (Don Quixote at 400, January 22, 2005), the government of Spain celebrated the anniversary by organizing a special pilgrimage route, the Ruta de Don Quijote, that followed the peregrinations of el ingenioso hidalgo around Spain. There were several new editions of the book in Spain, too, including a paperback made to sell to the masses at 1 € [US$1.30] a piece and a 3,000-page critical edition with illustrations and annotations. Many people have suggested that I read Edith Grossman's new English translation, which was released in a paperback edition in the Don Quixote year, but I have avariciously stuck with the translation I already own, Samuel Putnam's for the Modern Library, in consulation with the Spanish original. Later the same year, I took note (Jordi Savall and Cervantes, December 8, 2005) of a recording project undertaken by Jordi Savall with his performing groups, Hespèrion XXI and La Capella Reial de Catalunya, to recreate the "soundtrack" of Don Quixote. Every time that Cervantes mentions music being performed, which is quite often, Savall and friends tried to find the actual piece referenced by Cervantes or, when that was not possible, to find something from the period that was appropriate for what is described in the novel. 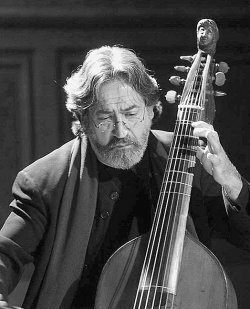 Savall and some of his performers presented excerpts from this project at some venues during their recent tours of the United States, but not at their appearance in Baltimore, which we had hoped to review but could not. Well, now a copy of that 2-CD set has come into my hands: over the next few weeks, I will be rereading Don Quixote and examining the sounds of the recording in conjunction with that reading. Readers are invited to join the Ionarts Book Club and make comments based on their own reading. One of the most remarkable things about Don Quixote, often acclaimed as history's first novel, is the narrative voice. Here is a narrator who presents himself as a researcher. Cervantes often refers to his knowledge of the "sources" of his story, as if he has pieced together a historical legend. The famous opening line ("In a village of La Mancha, the name of which I have no desire to recall, there lived not so long ago one of those gentlemen who always have a lance in the rack, an ancient buckler, a skinny nag, and a greyhound for the chase") sets this tone: the actual village whose name he knows but chooses not to put down. Soon after, he mentions "those who have written on the subject," the first reference to the 'sources', which include archival records -- "the learned ones of La Mancha were possessed of so little curiosity as not to be able to discover in their archives or registry offices certain papers that have to do with this famous knight" (Chapter 8). To fill in the lacunae, the chronicler claims that he miraculously came into the possession of an Arabic manuscript by one Cid Hamete Benengeli, purchased by chance in the marketplace of Toledo, which he had translated (Chapter 9). Furthermore, that the narrator is not supposed to be Cervantes himself: when Don Quixote's friends clear out his library, shown to be the source of the knight's insanity because he spends all his time reading chivalric romances, one of the books they decide not to burn is La Galatea by one Miguel de Cervantes (Chapter 6). This at once became for Don Quixote just what he wished it to be: some dwarf who was heralding his coming; and so it was with a vast deal of satisfaction that he presented himself before the ladies in question, who, upon beholding a man in full armor like this, with lance and buckler, were filled with fright and made as if to flee indoors. Part One (Yo soy la locura, or I am Folly) of the first Savall disc begins with an anonymous instrumental fanfare (percussion, shawm, sackbut) that represents -- in my opinion, although judging by the position of the piece, perhaps unintended -- the music that Don Quixote imagines in his addled brain. There are recitations of brief excerpts of the Spanish text, selected by Manuel Forcana, read by Jesús Fuente, Francisco Rojas, and Josep Piera, and interspersed throughout the musical selections, beginning with the famous opening lines. The next musical selection is a lute song, du Bailly's Je suis la folie, a brilliant use here of one form of La Follia, songs that were the basis for an almost infinite number of variation sets in the Renaissance and Baroque periods. This "folly" is the themesong of our crazed protagonist. Summer Opera 2006: "Lady Macbeth"
Summer Opera 2006: "After Life"
Summer Opera 2006: Patrick Burgan's "Peter Pan"
The Washington Ballet: "7x7: Women"
Just What Are the Bach Cello Suites?